Zero Conditional - used for present, real/factual situations If I drink coffee at night, I don’t sleep well. First Conditional - used for future real/factual situations If I drink coffee tonight, I won’t sleep well. Second Conditional - used for present or future unreal, imaginary situations Let’s look at those four example sentences again in this chart. 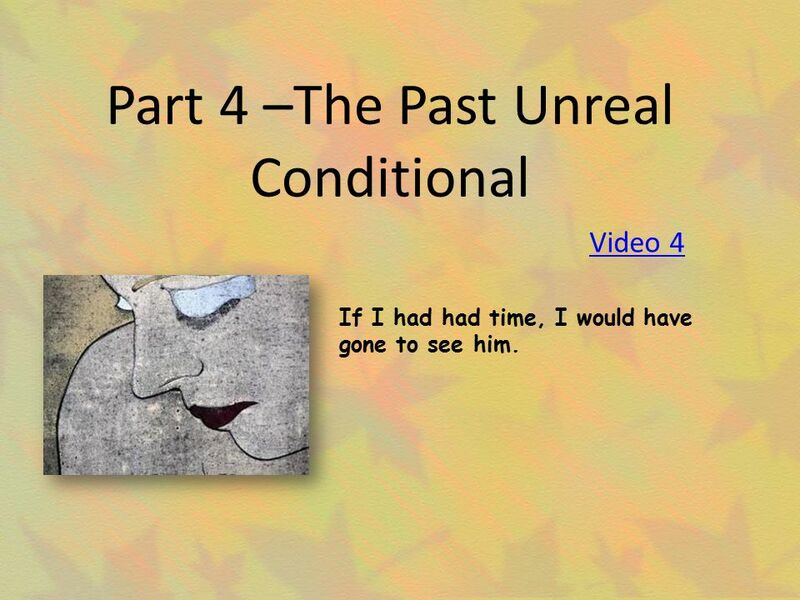 They represent the four types of conditional sentences you’ll study & practice in this tutorial. These four types have a variety of names. The 1st type is called the Zero Conditional or Present Real Conditional. It‘s used to describe facts & habits, or real situations. The present tense is used in both clauses. The next type is called the 1st Conditional, or Future Real Conditional. It is also used to describe real situations. The present tense is used in the if-clause, but the future tense is used in the main clause. 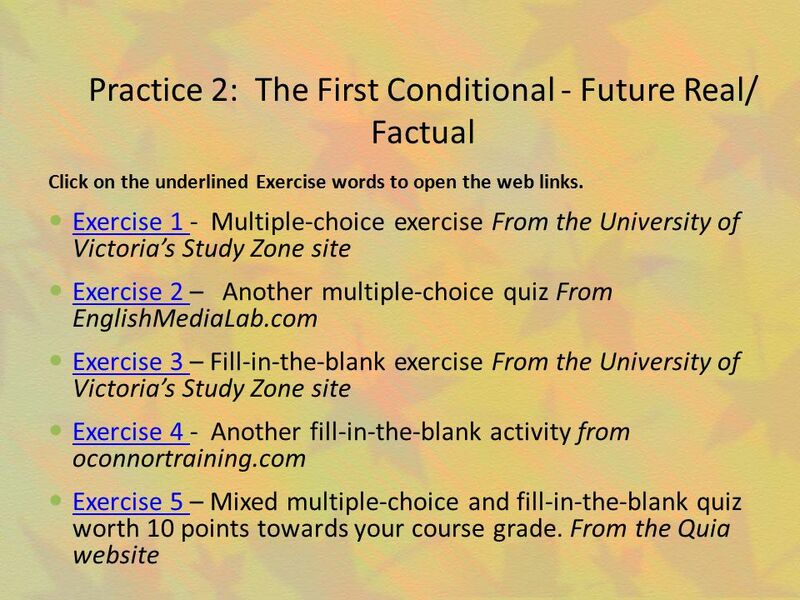 The third type is called the 2nd Conditional, or Present & Future Unreal Conditional. It is used to describe imaginary situations, situations that aren’t really truly happening now and that probably won’t happen in the future. Notice that even though you use this type of conditional sentence to talk about the present or future, we use the simple past tense in the if-clause. Strange, isn’t it? We also use the modal verb would plus the simple form of the main verb in the independent clause. The final type is called the 3rd Conditional, or Past Unreal Conditional. It’s used to talk about past situations that did not actually happen. We’re just imagining a different situation from what really did happen in the past. The past perfect is used in the if-clause, and would have plus the past participle is used in the main clause. That’s a quick summary. Now, are you ready to learn more about each of these 4 types of conditional? When you’re ready to start part 1, please click on the words “Part 1” in the navigation menu to the left of this screen. If I drank coffee tonight, I wouldn’t sleep well. Third Conditional - used for past unreal, imaginary situations If I had drunk coffee last night, I wouldn’t have slept well. 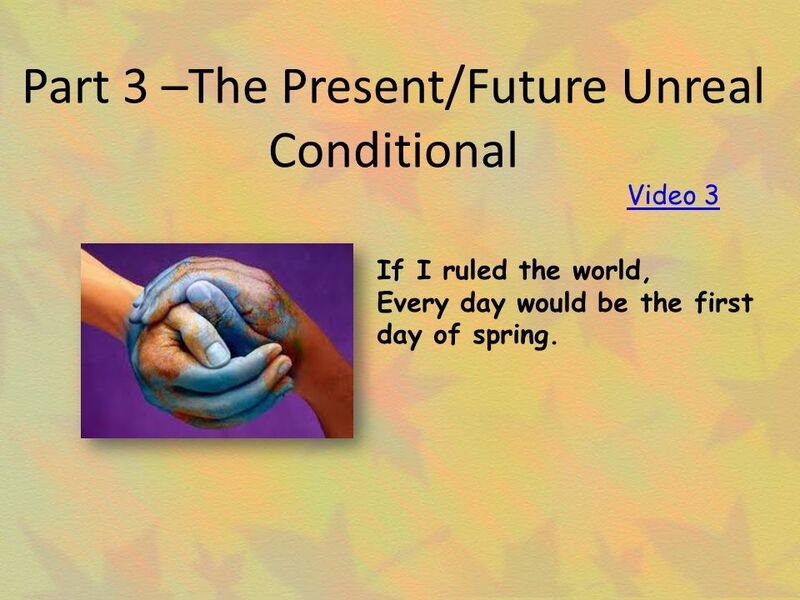 2 What are conditional sentences? VIDEO 1 IF a picture paints a thousand words, Then why can’t I paint you. (No voiceover – just audio clip of song If a Picture Paints a Thousand Words by Bread) The instructor will give students a due date to complete part 1 of the tutorial (view videos in tutorial and complete linked exercises). Results from the quiz from (quizzes yet to be made) will be recorded in Blackboard and be worth 10 points towards the students’ final course grades. It will also serve as evidence that students have completed the first part and assess their comprehension of the zero (present real/factual) conditional. Click on the underlined Exercise words to open the web links. Exercise 1 - Read the examples and then click on the link "If-Then Clauses 1“, a fill-in-the-answer activity, near the bottom of the page to do an exercise to check your understanding. From Exercise 2 – Look at the words and then write complete sentences. Remember to include an if-clause and a main clause and to use the present tense of the verbs. 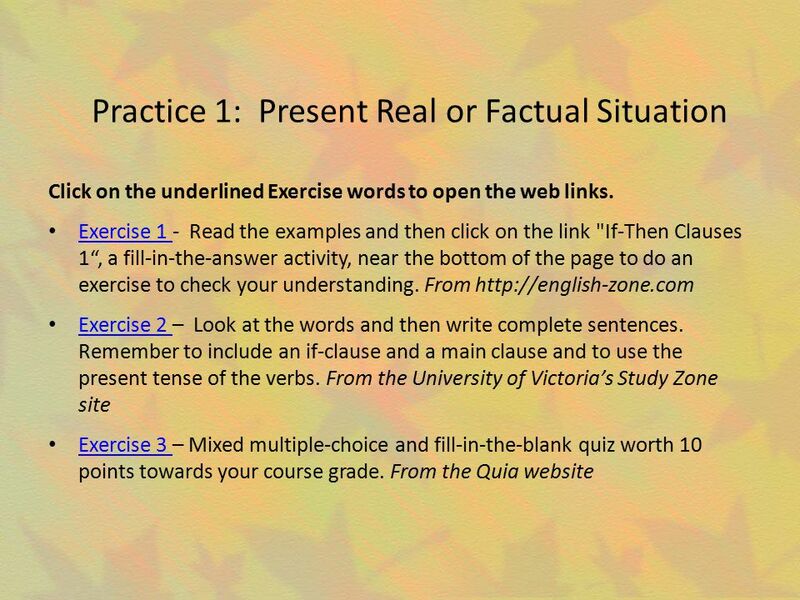 From the University of Victoria’s Study Zone site Exercise 3 – Mixed multiple-choice and fill-in-the-blank quiz worth 10 points towards your course grade. From the Quia website (No voiceover – just audio clip of song If You Leave Me Now by Chicago and If You Go Away by Neil Diamond) The instructor will give students a due date to complete part 2 of the tutorial (view videos in tutorial and complete linked exercises). Results from the quiz from will be recorded in Blackboard and be worth 10 points towards the students’ final course grades. It will also serve as evidence that students have completed the second part and assess their comprehension of the first (future real/factual) conditional. Video 2 IF you leave me now, you’ll take Away the biggest Part of me. (No voiceover – just audio clip of song If You Leave Me Now by Chicago and If You Go Away by Neil Diamond) The instructor will give students a due date to complete part 2 of the tutorial (view videos in tutorial and complete linked exercises). Results from the quiz from will be recorded in Blackboard and be worth 10 points towards the students’ final course grades. It will also serve as evidence that students have completed the second part and assess their comprehension of the first (future real/factual) conditional. Click on the underlined Exercise words to open the web links. Exercise 1 - Multiple-choice exercise From the University of Victoria’s Study Zone site Exercise 2 – Another multiple-choice quiz From EnglishMediaLab.com Exercise 3 – Fill-in-the-blank exercise From the University of Victoria’s Study Zone site Exercise 4 - Another fill-in-the-blank activity from oconnortraining.com Exercise 5 – Mixed multiple-choice and fill-in-the-blank quiz worth 10 points towards your course grade. From the Quia website Please click on the Exercise links to take you to websites where you will complete matching, multiple-choice, and fill-in-the-blanks exercises to check your understanding of what you learned in the video. The first three exercises come from a variety of websites. Exercise 4 (to be created on ) was created by your instructor and is worth 10 points towards the students’ final grades. The instructor will view student scores in the quia test manager webpage for instructors. Click on the underlined Exercise words to open the web links. Exercise 1 - Multiple-choice exercise From the University of Victoria’s Study Zone site Exercise 2 – Another multiple-choice exercise From better-english.com Exercise 3– Fill-in-the-blank exercise From the University of Victoria’s Study Zone site Exercise 4– A fill-in-the-blank activity from oconnortraining.com Exercise 5– Mixed multiple-choice and fill-in-the-blank quiz worth 10 points towards your course grade. From the Quia website Please click on the Exercise links to take you to websites where you will complete matching, multiple-choice, and fill-in-the-blanks exercises to check your understanding of what you learned in the video. The first three exercises come from a variety of websites. Exercise 4 (to be created on ) was created by your instructor and is worth 10 points towards the students’ final grades. The instructor will view student scores in the quia test manager webpage for instructors. Video 4 If I had had time, I would have gone to see him. (No voiceover – just audio clip of song “Shoulda Woulda Coulda” by Beverly Knight) The instructor will give students a due date to complete part 2 of the tutorial (view videos in tutorial and complete linked exercises. Results from the quiz from will be recorded in Blackboard and be worth 10 points towards the students’ final course grades. 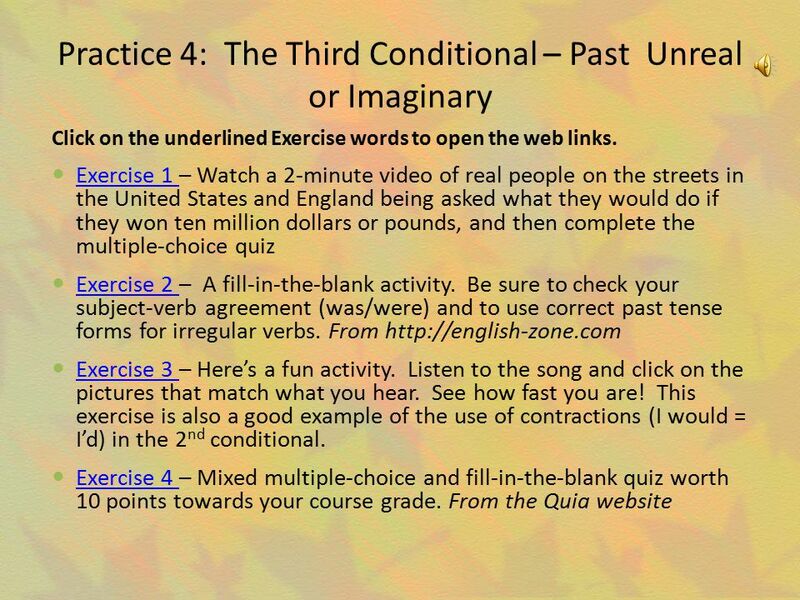 It will also serve as evidence that students have completed the fourth part and assess their comprehension of the third (past unreal) conditional. Click on the underlined Exercise words to open the web links. Exercise 1 – Watch a 2-minute video of real people on the streets in the United States and England being asked what they would do if they won ten million dollars or pounds, and then complete the multiple-choice quiz Exercise 2 – A fill-in-the-blank activity. Be sure to check your subject-verb agreement (was/were) and to use correct past tense forms for irregular verbs. From Exercise 3 – Here’s a fun activity. Listen to the song and click on the pictures that match what you hear. See how fast you are! This exercise is also a good example of the use of contractions (I would = I’d) in the 2nd conditional. Exercise 4 – Mixed multiple-choice and fill-in-the-blank quiz worth 10 points towards your course grade. From the Quia website Please click on the Exercise links to take you to websites where you will complete matching, multiple-choice, and fill-in-the-blanks exercises to check your understanding of what you learned in the video. The first three exercises come from a variety of websites. Exercise 4 (to be created on ) was created by your instructor and is worth 10 points towards the students’ final grades. The instructor will view student scores in the quia test manager webpage for instructors. 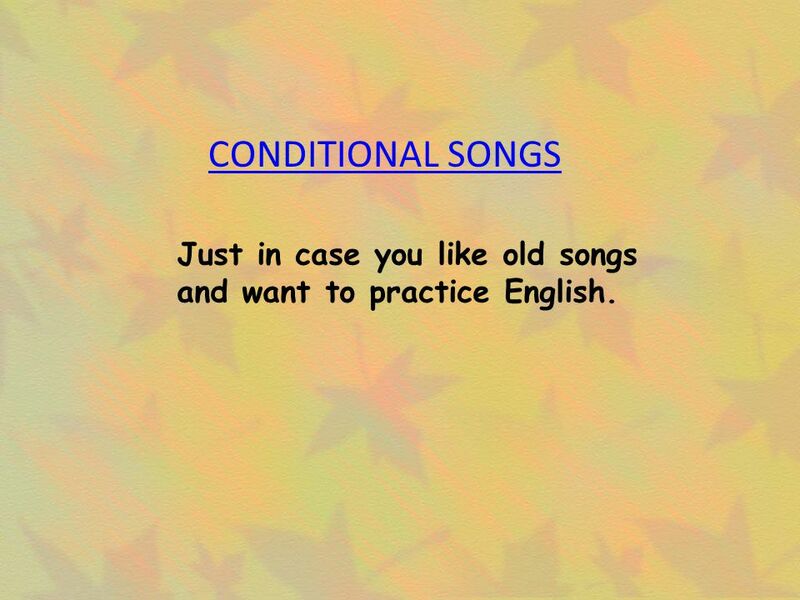 11 CONDITIONAL SONGS Just in case you like old songs and want to practice English. 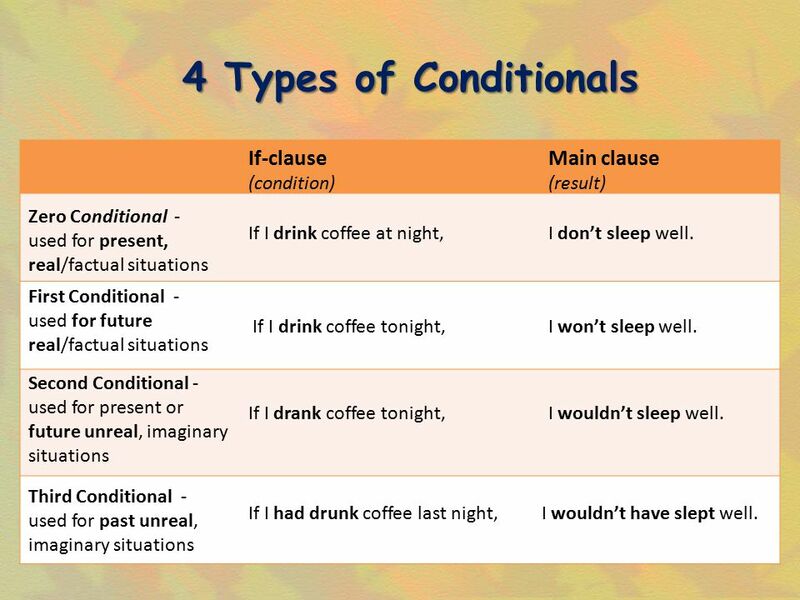 Download ppt "4 Types of Conditionals If-clause Main clause (condition) (result)"
IF condition GRAMMAR Done by : Samiha El9a7rah.com. Learning log 11/1 1. Go to 2. Find Video Achieve near the bottom of the page. 3. Click on. Scientific Language Program Grades 3-6. WELCOME! By the end of this workshop you will: 1.Understand the purpose of the course 2.Be able to use the worksheets. 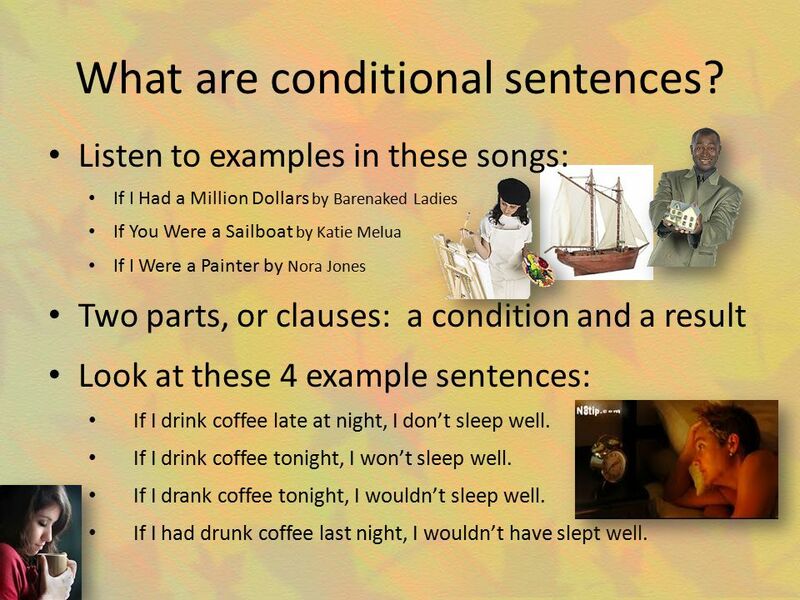 CONDITIONAL SENTENCES IF- Clauses May 2014 Ms. Leonor Laborinho. 1 IFC Session 5 Mulder If Clauses. 2 IFC Session 5 Mulder Type 0 Used for facts, generalisations and timeless statements. Normally present tense in the. Rubén Darío Muñoz Colegio El Amparo. What is the past of the verb “be” A. Was / Were B. been C. Am / is / are D. To be. We’ll be spending minutes talking about Quiz 1 that you’ll be taking at the next class session before you take the Gateway Quiz today. UNIT 8 Conditionals (1st and 2nd) 3rd YEAR EOI. Finish these sentences I won’t stop studying English until … … I have a good command of it. I’d like to. Conditional Lesson 33 Including the repetiton of  Unreal conditional Repetiton. ALL CONDITIONALS and future time clauses to talk about hypothetical, real, possible,improbable,impossible, regretful etc …. situations If …………… (and.